Oral Pro 1000 vs 3000 which one should you go for? Check our review where we analyse the key differences and similarities between the two Oral B electric toothbrush models and consider which one gives better value for money. Once you make out your mind to change to an electric toothbrush, you want to have the the best that provides value for money. Although there are many variables to consider, you can narrow down to a trusted brand like Oral B or Sonicare. However, even when you settle on a brand like in our case, Oral B, you are confronted with different models that have different features. In this post, we will compare the similarities and key difference between Oral B 1000 and 3000 to help you decide which one to go for. If you are in a rush, here is our brief Verdict. The Pro 1000 makes 20,000 pulsations per minute. The Oral B 3000 has three modes; Daily Clean, Sensitive and Gum Care. The Pro 3000 is supplied with the 3D White brush head specialized for whitening. The Pro 3000 being pricier than the Pro 1000.
connection to blue tooth app and a better casing. However when it comes to the core function of cleaning your teeth. The Oral B 1000 is just as good in removing plaque and cleaning under your gums as the 3000. It has slightly fewer pulsations than the 3000 but it is still effective in keeping your teeth clean. Considering the low price point of the Oral B 1000, it still provides good value for money compared to 3000. However to be more effective in your oral care regime, 3000 scores high. Here below is a more elaborate analysis. The Oral B 1000 has just one brushing mode, the Daily Clean Mode. The Oral B 3000 has three modes; Daily Clean, Sensitive and Gum Care. 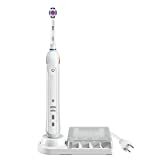 The Oral B 1000 package comes with a charging station, a toothbrush handle and a brush head for precision cleaning. The Oral B 3000’s package comes with a brush head for precision cleaning, a charging station with a storage box for four brush heads and a brush handle. The Pro 1000 is packaged with the CrissCross style brush head for plaque removal while the Pro 3000 is supplied with the 3D White brush head specialized for whitening. The Pro 3000 has a visible pressure sensor that alerts you when you are brushing too hard. The pressure indicator is a red LED light at the back of the toothbrush handle. The Pro 1000 has a pressure sensor too but stops oscillations in case you are brushing too hard. The motor on the Pro 3000 delivers a bit more power through the number of pulsations per minute. It makes 40,000 pulsations per minute while the Pro 1000 makes 20,000 pulsations per minute. The Pro 3000 is Bluetooth enabled, allowing a connection between the brush and your iOS or Android device via an app. This feature improves the functionality of this model, as the app is a real-time guide that provides tips, tricks and more features like calendar integration. The Pro 1000 is not Bluetooth enabled. The Pro 1000 comes in a glossy, white plastic body with a rubber panel that is mounted on the front and runs down the back of the handle. This rubber on the 1000 model is usually either black or baby blue in color. The design is pretty much the same on the Pro 3000, but it comes in either all white or royal blue. There is also a price difference, with the Pro 3000 being pricier than the Pro 1000. Both the Pro 1000 and the Pro 3000 come with one handle each. Both have inbuilt timers to allocate enough time to clean each of the four quadrants of your mouth within the recommended 2 minutes. You will get alerts at 30-second intervals to know when to change to another quadrant. They both come with a small, round brush head that surrounds each tooth for better cleaning across the teeth. Both models have a pressure sensor that stops oscillations when you are brushing too hard. They are both rechargeable, with a battery life of 7 days. Both have powerful motors that make +8,800 oscillations per minute. They both have a similar design and are the same weight and size. They both provide superior and more efficient cleaning compared to a manual toothbrush. They both come with a 2 year warranty. They use the same charging station. Neither of them comes with a travel case or a travel charger. It comes with a CrossAction brush head that surrounds each tooth with angled bristles. Along with the oscillations and pulsations, it works to break up and remove plaque around the tooth and along the gum 300% better than a manual toothbrush. It is equipped with a built in timer that lets you know when the dentist-recommended 2 minutes of brushing time is up. The Daily Clean mode on this model makes sure it stays ready. Has a fast motor that makes 20,000 pulsations per minute and 8,800 oscillations per minute. Minimizes over-brushing, as it has a pressure sensor that stops oscillations when you are applying a lot of pressure. The rubber on the handle ensures a nice, firm grip, even with wet hands. It has indicators on the handle that show when it’s charging and/or when the battery is getting low so you know when to charge it. It is compatible with the extra Oral B brush heads available. You can buy a different preferred brush head and swap it out with the one it comes with. It is available at a decent price. The bristles on the default CrossAction brush head this model comes with might be a little stiff for people with sensitive teeth or gums, and they will need to spend more investing in something more suitable. Makes a loud noise when working. Some might find the one speed to be too fast and too hard. Has 3 modes, Daily Clean for precision, everyday cleaning, Gum Care that stimulates gums gently and Sensitive for lower speeds to be more gentle while cleaning sensitive teeth. It has a visible pressure sensor that alerts you via an LED light when you are using too much pressure while brushing, and stops oscillations to preventing harmful over brushing. Has a timer that buzzes in 30-second intervals to let you know when to move to the next quadrant of your mouth while brushing, so you can brush for a total of 2 minutes. This is the length of brushing time that dentists recommend. The design of the brush head ensures that the bristles wrap around each tooth for better cleaning. The brush head is specialized to whiten teeth by effectively removing surface stains with the help of a polishing cup at the center. Has Bluetooth capabilities and app support to improve functionality and subsequently helps you have a better routine for better dental hygiene. Powerful motor that makes 40,000 pulsations per minute and 8,800 oscillations per minute. It makes rotations too for a dynamic 3D cleaning action that breaks up and draws out plaque. Has battery indicator lights on the handle. Since this model has advanced features, it is a bit pricier. Has a short battery life, which is expected considering the Bluetooth connectivity feature. Some find it too loud as it works. In conclusion, either of these brushes could be the right pick for you. The Oral B 1000 could be best suited for people who are transitioning from the regular manual brush to an electric brush. The Oral B 3000 could be more suited for users who are already familiar with the electric brush and are looking for more features, or users with sensitive teeth. Either way, both will do a great job at keeping your teeth clean and healthy.